Working with locally available plants and fibres to create beautiful dyed and woven textiles. Flora and Naomi work creatively with natural materials to connect people to the natural world, celebrating the abundance and connecting with what it means to be of this land, through practical relationship with plants, fungi and fibre. You are welcome to come to one day or two. Exploring natural dyeing techniques to create a variety of colours and effects on wool. 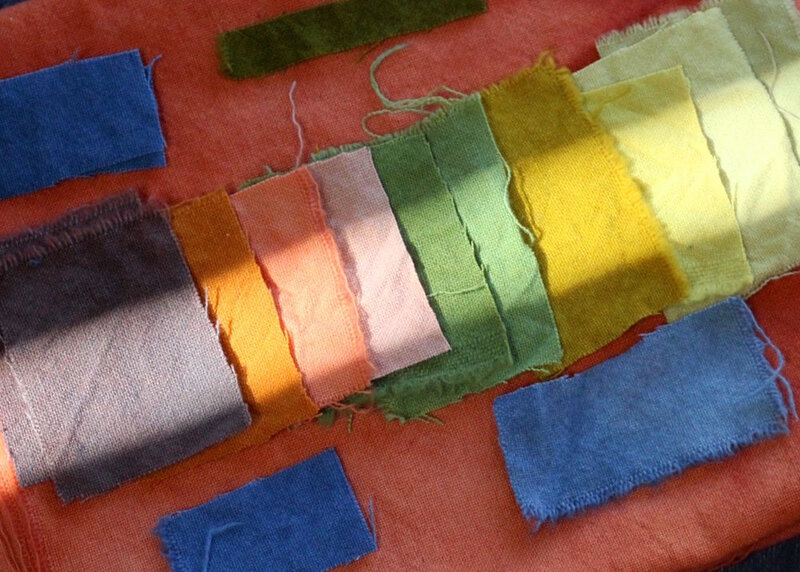 Create a spectrum of colour samples and some fabric to use in a textile project such as a scarf or cushion. We will also do some bundle dyeing, a technique involving binding and steaming the fabric to produce patterns and prints. This is an introduction to processes through which you can achieve colours from plants that grow all around us. Such as gorse, nettles, walnut, onion skins, dandelion, oak. We will go for a walk and see what natural dye plants are available to us in the landscape, we can gather some plants for the dye pot. These are softer earthy colours - the colours of our landscape. We will be using Non-toxic plant mordants - tannin, natural acid, and symplocos (an alternative to alum). We will also create strong, vivid colours using traditional dye plants such as madder and weld. These plants have been used for thousands of years to colour the textiles of our ancestors all around the world. We will apply simple shibori resist techniques using clamps, wood blocks, and string to create patterns on the fabric. If you are also coming to the weaving workshop on the Sunday, you can dye some wool to add to your project. A workshop that combines the ancient craft of peg loom weaving with a space to reflect, dream and make. A time to busy the hands and quiet the mind as we explore different fibers, colours and ways of working with raw wool. Everyone will leave with their own unique sitting matt and will have learnt about weaving, how to thread the peg loom and how to weave to create different patterns and blocks of colour. I am have a background in the arts, nature connection, facilitation and group work. This workshop reflects the alchemy of a craft based on raw materials from the land and the processes that turn it into something new. It is a time to embody a craft and allow our hands to lead the process. Over the last 8 years I have been weaving and developing these dreaming mats; travelling to meet shepherds, small holders weavers, spinners and small flocks, exploring how fibre can be used to connect communities and build connection with the land.